Title: "Don't Just Read Your Bible -- Count It"! Subtitle: This startling challenge caused Cutting Edge research volunteers to begin counting the KJV as an occultist would count it. Since Bacon and his Knights of the Helmet possessed the original KJV manuscript for about one year (1610-1611), they had the time to reconstruct the Bible so that its fundamental construction would be identical to the key foundational symbols of Freemasonry! Remember, our key understanding: these wicked, occult men, with all the power and skill of the English government at their disposal, could not change the text. Not one doctrine was ever changed by the actions these men took to create a Rosicrucian Bible which was designed to move the peoples of the world into the practice of a "Mystic Christianity", i.e., Rosicrucianism. Therefore, we can set aside any and all doubts and worries about our eternal security as we look at this historic truth about the 1611 KJV. Your KJV is wonderfully sound, and its doctrines will lead you directly into Heaven if you heed them. Before we get started in this first article in our journey to discover hidden truth about the 1611 King James Version of the Bible, let us remember our main premise: even though some of the most evil men in world history had their hands on the King James Bible from the inside out, they could not change one bit of the text! Please take a moment to read our original treatise on this most important subject, in our "Defending The KJV" section. As we alluded, above, Cutting Edge Ministries is NOT saying that Sir Francis Bacon "wrote the KJV". We will never say that. Our research indicates that the official KJV scholarship committee completed their work in 1610 and handed the manuscript to King James. The King then promptly gave that manuscript to Sir Francis Bacon, who possessed it for about one year, until 1611, when he handed the manuscript back to the King, who promptly sent it to his official printer. Historians have debated why King James felt that Bacon needed this manuscript for one year and what Bacon did with or to the manuscript while he had it for that time. Now, however, we feel confident that Bacon used this time to plan how to coordinate the text with all these symbols -- page after page after page! NOTE: We have another, and cheaper source, for these original 1611 King James Bibles! A website called GreatSite.com has these Bibles. They are computer scans of an original 1611 KJV. Please go to: http://www.greatsite.com/facsimile-reproductions/kingjames-1611.html -- Note that the cost from this web site is "only" $249. "Don't Read Your Bible -- Count It"! This startling challenge came from an occultist with the handle of "Satanic Red". Once he issued the challenge, our volunteer researchers went right to work. What we have uncovered is most significant! Sir Francis Bacon, King James I, and the Knights of the Helmet planned to produce a "Rosicrucian Mystic Bible", which would reverberate with occult power every second because of all the Satanic symbols it contained, so that all the English-speaking peoples of the world would be gradually moved into a practice of the "Mystic Christianity" called Rosicrucianism! But, the Holy Spirit excited such opposition from leaders of both the Pilgrims and the Puritans, and from within the clergy of the Anglican Church, that no one would even consider the KJV as long as it contained these horrible images. Since the Holy Spirit had already preserved the KJV text, once government leaders -- long after King James and Bacon had died -- removed these offending images, the KJV Bible was a very fine Bible. This story is the most exciting example in the modern era where the Holy Spirit prevented the destruction of God's Word. Jesus had promised, "Scripture cannot be broken" (John 10:35). Your faith in Jesus Christ should simply soar once you realize how He completely foiled the plot of British King and Government to change God's Word into a spiritually defiled Rosicrucian Bible! At this point, we need to stop to ask a very important question: if Bacon and King James planned to create a Rosicrucian Bible, what would their symbol for that Bible likely be? We submit to you that the symbol of this planned "Mystic Christianity" would look very much like this symbol to the left. 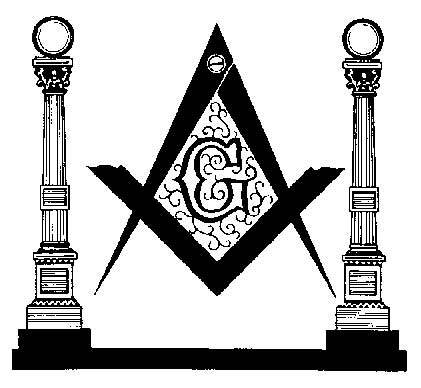 As you can see, two pillars are depicted, with the famous Masonic emblem in between known as the Square and Compass. 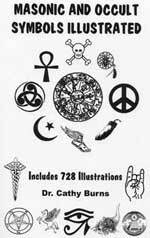 Since the average person today knows nothing about "Satan's devices" and so can look right at a Satanic symbol without knowing what they are looking at, let us spend a few moments describing the meanings of this symbol. First, let us speak directly to the issue of the pillars. Let us stop here to digest what we have just read. * " an underlying base or support; especially : the whole masonry substructure of a building - a body or ground upon which something is built up or overlaid"
Therefore, we might consider these two pillars to represent the "underlying base or support", or that supporting device " upon which something is built up or overlaid"
* " a basis (as a tenet, principle, or axiom) upon which something stands or is supported, i.e., the foundations of geometry"
Likewise, these columns represents the "axiom upon which something stands or is supported"
Now, let us briefly consider the most famous of Masonic symbols, the Square and Compass. Rather than take the time and space here to describe the meanings of this symbol, take moment to read Free17, one our original Freemasonry articles. Now, we need to dig a little deeper in our understanding of this symbol of the Masonic Square and Compass in between the two pillars. Masons can properly understand that these two pillars represent a "portal" through which an initiate must step if he is to become a dedicated Mason on his way to becoming a perfected Man. As the initiate steps into the world of Freemasonry, he symbolically steps right into the Square and Compass and enters the rarified air of Mystical Freemasonry. 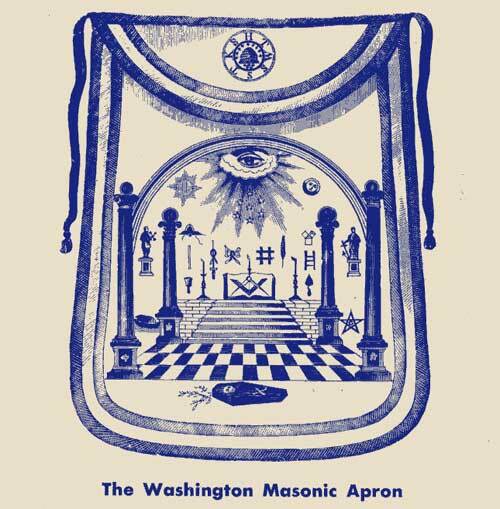 This picture depicts the image on the Masonic apron of President George Washington. For the purposes of this article, focus on the inner two pillars and the steps leading up to a KJV Bible with the Masonic Square and Compass lying directly on its open pages. These images frankly scream at you, as they almost perfectly depict the symbolism of the Rosicrucian KJV Bible which Sir Francis Bacon and King James I planned to put into every church and every home in English-speaking world. Notice, also, the All-Seeing Eye of Lucifer hovering over the entire scene, looking approvingly downward on his newly formed Rosicrucian Bible. The alchemical Sun and Moon are shown to the right and left, respectively, of the Eye. Precisely six steps lead up to the Bible. Six is critically important to the occultist, because "six" is the number of the Masonic Perfected Man. Further, the number, "66" is the number of Perfect Government, while "666" is the number of the Perfect Man who will arise to take control of the Perfect Government. Masons will hail him as their "Masonic Christ", New Age adherents will call him "Maitreya the Christ", but the Bible will call him "Antichrist". 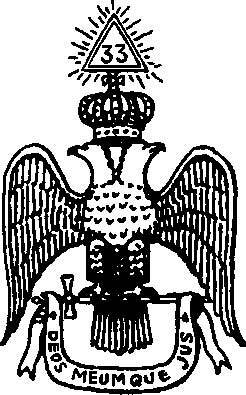 Before we go into our discussion as to how a Rosicrucian Bible can be symbolized by our first symbol, the two pillars and the Square and Compass, we need to realize the importance of "33" to the Mason. 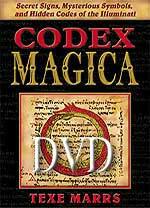 Notice that this occult author actually describes the Double-Headed Phoenix, shown to the left, with the mysterious number "33" in the middle. Listen as van Buren gushes even more eloquently about the supreme importance of the number "33". Since the '33' symbolizes the highest spiritual conscious attainable by the human being", you can understand how Masons can, and do, look upon the "33" as being synonymous with his Lodge. Indeed, the Masonic Lodge can be thought of as being symbolized with the number "33". Thus, as we go back to our original image, above, of the two pillars with the Square and Compass in between, you can visually replace the Square and Compass with the number "33". In the numerology of which van Buren spoke, and which Bacon used, his very name equaled "33" in the system called "Simple Cipher". And the mysterious “G” in the center of the compass and square of Freemasonry has a “K-cipher” value of "33". Therefore, you really can place the number "33" in between the pillars, instead of the Square and Compass! In fact, please take a few moments to familiarize yourself with the reality that occultists truly revere numbers, believing they contain inherent Luciferic power, by reading a key article on this subject, NEWS1756, "Events Continue To Occur According To The Numbers -- Occult Numbers". Then, you will be prepared to understand the rest of this article. Now, consider our blockbuster revelation! Sir Francis Bacon and his Knights of the Helmet spent part of their year in which they possessed the KJV manuscript re-arranging the Bible so that its very structure formed two pillars -- from Genesis 1 to Revelation 22 -- with the mystical number "33" in the middle! The very structure of the 1611 KJV forms the very structure of Masonry, as depicted by our original symbol, above! To understand how they could do this, we must first speak to the issue of their manipulation of chapter and verse numbers of their 1611 KJV, as compared to the 1599 Geneva Bible. Before we get into this subject, remember that we are not talking about changing the words of the meanings of words. The text of the KJV is fine. We are only talking about changing chapter and verse designations, which were never inspired by the Holy Spirit in the original Greek and Hebrew Scripture. Let us first examine historic truth of chapter and verse designations as revealed by Wikipedia Online Encyclopedia. The charge that chapters and verses were “divided into chapters in an incoherent way, or at inappropriate points within the narrative” only serves to lend credence to our position that they were manipulated for purposes other than academic. Indeed, this manipulation formed the 1611 KJV Bible into the two pillars with the number "33" in the middle, as we shall prove at the end of this article. It is important to understand that the original Hebrew and Greek manuscripts from which the 1611 KJV Bible was translated do not even contain punctuation, much less chapter and verse divisions! So all numerical divisions of the text that took place were purely arbitrary and wide open to manipulation. And a careful analysis of the differences between the Geneva editions and the King James Version (KJV) which came later, show definite signs of such tampering. Additionally and undeniably, the total number and exact placement of the various Books within the Bible was established at some point prior to 1560. That was when the Geneva Bible was first published in which both the Old and New Testaments were included. And the reason we know this to be true is that the ancient Jewish canon of Scripture not only contains fewer Books (24 instead of the 39 we have today), but in several instances their order was quite different from their counterparts in our Old Testament. Then as a side note, we want to point out something that bears upon this discussion. One of the 14 or so “ground rules” given by King James to the translators of the 1611 Bible was that “the division of the chapters to be altered either not at all, or as little as may be, if necessity so require.” (An Historical Account of the English Versions Of The Scriptures, from the English Hexapala, published by Samuel Bagster and Sons, A.D. M.DCCC. XLI, emphasis ours). King James had just authorized someone to change chapters "if necessity so require"! Any change the Knights of the Helmet implemented could be defended on the basis of "necessity". Why do you suppose King James placed this particular rule upon them? Of course one logical reason may have been that nearly 50 years had elapsed since the1560 Geneva Bible was published and the KVJ translators were assigned their task. So by that time it is reasonable to assume the public would have become accustomed to using those divisions in reference and memorization. But we submit that there was also a more devious reason behind the king’s command. Since he was a Rosicrucian and Freemason himself, he undoubtedly would have approved of the manner in which Bacon and his Knights of the Helmet slightly changed chapter and verse divisions in order to produce a Rosicrucian Bible organized in the manner of the two pillars and the Square/Compass/"33" between. As you can see, somebody involved in producing the KJV made a lot of changes in chapter/verse divisions from the Geneva Bible! We encourage you to study these changes in depth, for you will realize that none of these changes, in and of itself, were major. They were very minor. However, these changes did produce a very startling change in the structure of this Rosicrucian Bible. We shall now prove that the original 1611 KJV Bible was deliberately constructed in such a manner that the structure of the Bible is exactly identical to the two pillars with the Masonic Square/Compass/"33" in the middle. When the KJV was constructed, after the original KJV scholars had given the document to King James I in 1610, one of the changes which were made involved these chapter/verse changes. These seemingly slight changes produced a dramatic effect, as these two pictures illustrate. The structure of the Bible was slightly changed so that the two pillars -- Boaz and Jachin -- were created with a "33" in the middle. Psalm 117 is the chapter in the middle -- representative of the Masonic Square and Compass and/or the sacred occult number, "33". There you have it! The Bible is comprised of 1,189 chapters. Each pillar comprised of 297 chapters on each side produces 594 chapters. When both pillars are counted, you have 1,188 chapters, with the one chapter in the middle -- Psalm 117. Let us examine this Psalm now so you can see that it forms a perfect "33" -- once a tiny bit of manipulation was carried out! O praise the LORD, all ye nations: praise him, all ye people. 2 For his merciful kindness is great toward us: and the truth of the LORD endureth for ever. Praise ye the LORD. This most beloved short Psalm has gladdened the heart of many a genuine Christian, and will continue to do so until the Lord Jesus returns for His Church. This Psalm reassures us that God blesses all nations of the earth who have received His mercy and loving kindness. And, we are reassured that this wonderful Mercy and Grace of God are forever! Or is that "for ever"? You see, this Psalm contains 32 words, unless you split the word "forever" into two distinct words, "for" and "ever". Then, you get exactly 33 words in this Psalm! This kind of text manipulation is very common throughout the KJV text, but such manipulation changed none of the original meaning of the text. Therefore, the meaning translated from the original Greek and Hebrew is unchanged. But, Sir Francis Bacon, King James I, and the Knights of the Helmet achieved what they wanted to achieve! They got a structure for the entire KJV which is exactly the same as the symbol of the two-pillars with the number "33" in the middle! Psalm 117, being the “odd” chapter of the 1189 (1188 plus 1), is positioned in the very middle. It is almost waving its arms, as it were—calling our attention to the fact that it is not only the middle chapter of the Bible, but is also the shortest—consisting of exactly 33 words. Thus as we visualize the two pillars framing the number 33, we are viewing but one of the many elaborate “look at me” signs intended by Bacon and his Knights of the Helmet who orchestrated them! Thus was the original KJV Bible constructed exactly as a Freemason would like to have it constructed -- two pillars with a "33" in the middle! Without changing the meaning of the text whatsoever. Now let us address the significance of 1 Kings 6-7 and Jonah 3-4. As you can see from the hand drawing on the right, above, 1 Kings 6-7 speak to the Solomon's Temple, while Jonah 3-4 speak of the great city, Nineveh. 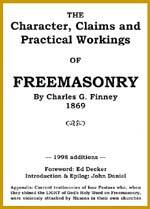 Both cities are very significant to Freemasonry, and frame important basic doctrines of Masonry. These two chapters describe the building of Solomon’s Temple—“holy ground” for the Freemason. How important is Solomon's Temple to the Freemason? 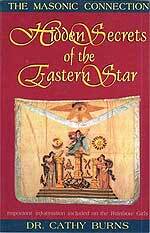 Let us go again to one of the most famous of all Masonic authors, Albert Mackey, 33rd Degree. In a Masonic Bible, on our bookshelf, the Temple Illustrated Edition, the author of the Foreword sheds some further light upon the importance of Solomon's Temple to Freemasonry. There is simply no other portion of Scripture more precious to the Freemason than 1 Kings 6 and 7, so it is entirely predictable and quite understandable, that these two chapters form the top of the first great pillar of this 1611 Rosicrucian Bible! Freemasons absolutely love Nimrod, the fountain-head of all Black Magick Witchcraft in the world. In fact, this current Masonic drive to the New World Order is nothing more, nor less, than Satan's second attempt to rebuild the Tower of Babel! Therefore, Jonah 3-4 is another blockbuster chapter with which to adorn their second great pillar of the Bible. Thus, with these perfectly balanced series of chapters, a depiction of two “pillars” is created — each of which is holding up a critically important tenet of Freemasonry. Without extensive manipulation of the order and division of the Old Testament canon, this balanced mathematical structure of the 1611 KJV, and its relationship to those particular passages of Scripture would not have been possible! This Bible would have gone to print with other chapters being in place at the 297-chapter intervals and they would not have held the significance to the Mason as the ones we have listed, above. And, without the simple separation of the word, "forever" into "for" and "ever", Psalm 117 would not have been the perfect chapter to place in the middle, because it would have contained only 32 words, not 33. We have even discovered some modern KJV printings which have joined this word, because that is the normal English usage. Rest assured, in our original 1611 KJV, the word is separated by a space! Is this manipulation proof that Bacon and his Knights of the Helmet wrote the KJV? By no means. It simply tells us what Bacon and his literary group were doing when they had the original manuscript from 1610 - 1611. They were assembling their coveted Rosicrucian Bible, their masterpiece -- covering good text with all these horrific images straight from the Abyss. As I have said before and will repeat it again and again - these dedicated Luciferians could not change the text one iota! Praise the Lord Jesus Christ and His wonderfully Omnipotent Holy Spirit. Jesus promised "Scripture cannot be broken" (John 10:35). Let us love the KJV for the right reason: the Holy Spirit protected its text against the most evil and most powerful men in world history who tried to tamper with it. While the Rosicrucians -- backed by the power of King James' throne -- implanted so many symbols, they could not touch the text. Jesus' protection of the KJV text in the face of determined British Government attempts to corrupt it is the greatest reason I can ever think of to really love and trust the KJV!